There’s a strong case to be made that school safety is part of homeland security. This is not to suggest the creation of another DHS component (God forbid), but instead, to consider that when violence occurs in a school—be it a shooting or in some other form—that’s about as close to home as security gets for thousands of American families. Did we only offer thoughts and prayers after 9/11? Did we devolve into fruitless groundhog-day like debates while doing nothing? Of course not, and the country is far safer for it. Now consider that the number of Americans affected by school violence is enormous—those killed, those wounded, and all of their classmates, and the school staff, and everyone’s families. Taking just mass shootings, since Columbine, 223 people have been killed in school mass murders—we think. According to an NPR analysis of the 2015-2016 Civil Rights Data Collection survey, we actually don’t know how many children, teachers, staff and others are being killed or injured in acts of school violence. Is that not staggering? Think of all we’ve done to guard against terrorism and natural disasters—and we don’t even know how many people are dying in schools. In America’s schools. This is profoundly troubling, and there is a big role for the homeland security and public safety community to play in finding solutions to the plague of school violence. And with that, I ask you to join me and thousands more in viewing a live, online summit being presented by the University of Southern California. This event is somewhat different than most, and it’s impact can be potentially greater than most. Indeed, the Summit (explained in detail below) is not some event to be viewed over lunch and forgotten as quickly as the last school shooting. Instead, it is the start of a concerted effort. It starts with a Summit, which presents the insights of students who have survived school violence, including in Parkland and at Virginia tech; it gathers the insights of public safety, school resource and public health professionals; and it queries the media on how they make decisions when covering an act of school violence. From this, every viewer is left with ideas. 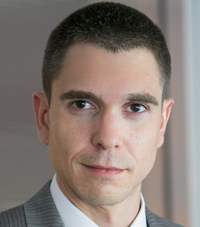 It leads to e-mails to colleagues and discussions at conferences. It prompts phone conversations and new connections. Endeavors start at institutions. Solutions arise to insidious challenges. It can change things—but this necessary effort will not happen on its own, evidently. Please watch the live USC National Safe Schools Digital Summit on October 24, 2018. It’s free, you don’t need to register, and it starts at 8:30 AM PT/11:30 AM ET. The first panel begins at 9PT/12ET. Check out the website—usc.edu/safeschools—and add it to your calendar. What will you get from watching? A lot of genuine information. Beyond that, I don’t know. That’s kinda the point. 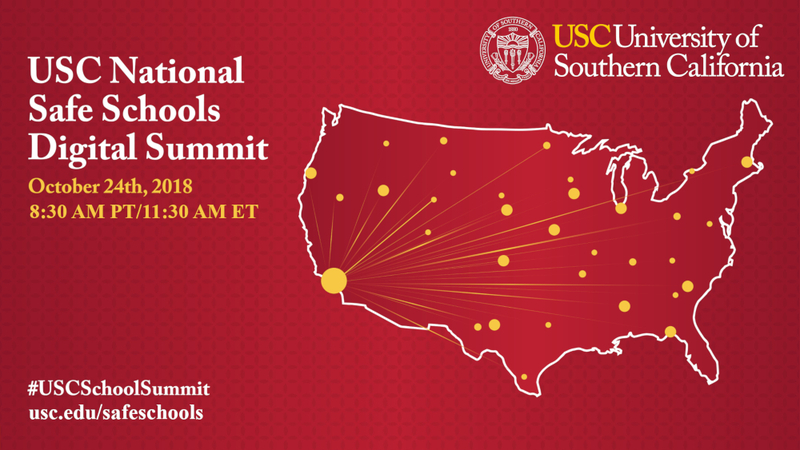 The USC National Safe Schools Digital Summit will stream live online on October 24, 2018. The summit begins at 8:30 AM PT/11:30 AM ET, and the first panel starts at 9 AM PT/12 PM ET. The event is being offered exclusively online and will stream on the event website, usc.edu/safeschools. The event is free to view, and no advance registration is required. Students from schools affected by violence will share critical insights into their experience, their concerns, and the role they can play in supporting a safer school environment. The panel will be moderated by American actor Denzel Whitaker, and panelists include students who survived mass shootings at Virginia Tech and Marjory Stoneman Douglas High School in Parkland, Florida. Making a school safer requires a collective effort among security, public safety and public health professionals. The panel will discuss trends in school violence, best practices for creating a more secure campus environment, and the innovative approaches that can enhance school safety. The panel will be moderated by Secure Schools Alliance Executive Director Robert Boyd and panelists hail from the law enforcement and public health professions. Each panel will be followed with a brief Q&A discussion, drawing questions from the online audience via social media. Using the hashtag #USCSchoolSummit, viewers can join the conversation via the Safe Communities Institute Facebook and Twitter accounts. Visit the event website—usc.edu/safeschools—to explore the panelists and panels and to add the event to your calendar. Join us for these essential conversations that can move us toward a new understanding of school safety.